Western Art Collector features Camille Engel's award-winning painting, “Out on a Limb” in an article on Gilcrease Museum's “American Art in Miniature” exhibition. Published in the January 2009 issue of the magazine. American Art Collector magazine features Camille’s painting, “Berry Eater” in the article titled “Keeping it Real” – International Guild of Realism’s annual winter show was held at the Scottsdale Fine Art gallery. 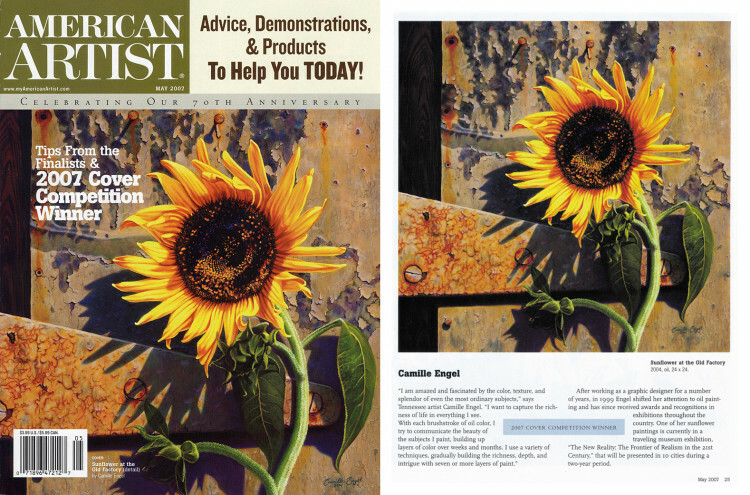 “Sunflower at the Old Factory” selected as THE WINNER in the “American Artist Magazine” 2007 Cover Competition. The painting is featured on the cover of the May 2007 issue along with quotes from Camille and a description of the painting in the feature article. We are thrilled that American Art Collector chose Camille Engel for these three articles. See the full articles in the October 2012 issue. 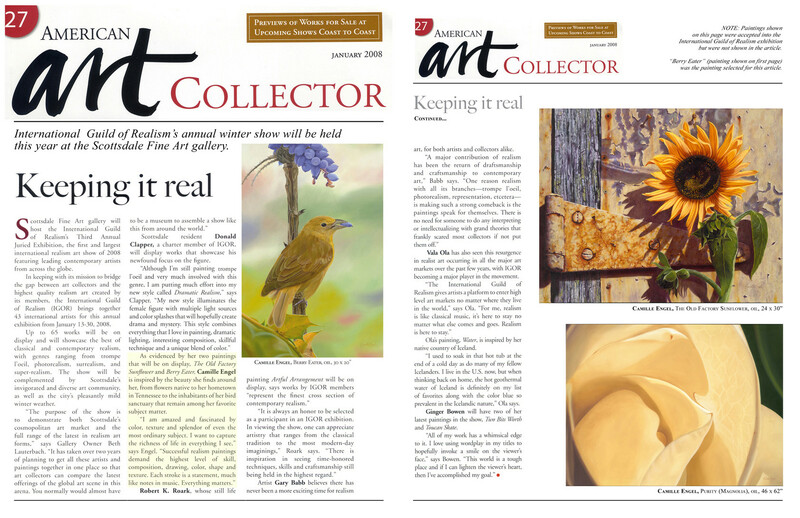 2011 American Art Collector "Get Real" and "Savvy Collector"
We are thrilled that American Art Collector magazine chose Camille Engel for these two articles. See the full articles in the October 2011 issue. 2011 American Art Collector "Salon International"
We are thrilled that American Art Collector magazine chose Camille Engel as one of the artists in their "Salon International" article. See the full article in the April 2011 issue. 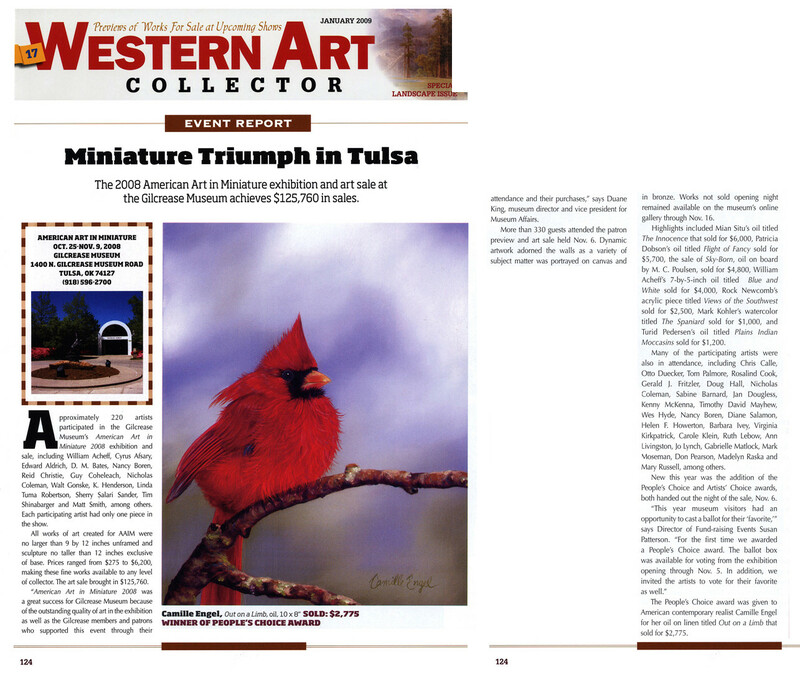 2011 Southwest Art Magazine "The Perfect Piece"
We are thrilled that Southwest Art magazine chose Camille Engel as one of the artists for this article. 2009 American Art Collector "A Return to Tradition"
We are thrilled that American Art Collector magazine chose Camille Engel as one of the artists for their "A Return to Tradition" article. See the full article in the September 2009 issue.